Mirror angle can be adjusted using the switch. To select a mirror to adjust, press the switch. To adjust the mirror, press the switch. 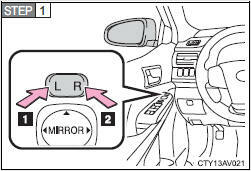 Push the mirror back in the direction of the vehicle's rear. The “ENGINE START STOP” switch is in ACCESSORY or IGNITION ON mode. Turn on the mirror defoggers to defog the mirrors. ■When driving the vehicle Observe the following precautions while driving. ■When a mirror is moving To avoid personal injury and mirror malfunction, be careful not to get your hand caught by the moving mirror. 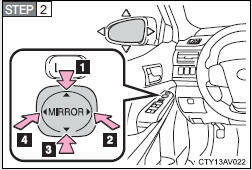 ■When the mirror defoggers are operating (vehicles with mirror defoggers) Do not touch the rear view mirror surfaces, as they can become very hot and burn you.